First things first. Aperture is the size of the opening in your lens when you’re taking a photo. Think of it as how wide open your eye is when taking in a scene. Aperture manipulates a photo more than any other mechanism on your camera, because it affects both level of brightness and degree of focus in a single click. How it works. Increasing your aperture (wider, more light, smaller focal point) is achieved by lowering the physical number of your f/stop. While lowering your aperture (narrower, less light, larger focal point), is achieved by increasing the number of your f/stop. Got it? If not, it’s OK. Practice will do you more good than any amount of technical advice you’ll read here or elsewhere. 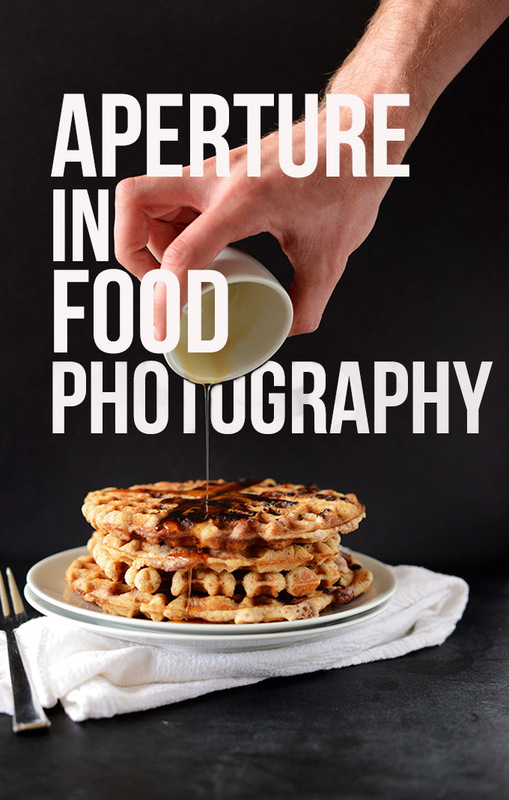 Now let’s talk about how aperture can actually improve your food photos. It’s all about focus. What it does. A larger aperture (i.e. f/1.4) creates a halo effect in your photos where one point is in focus and the rest is blurred. The technical term for this is “bokeh.” Oh glory I love bokeh. It draws the viewer’s eye exactly where you want it and forces them to forget the rest. This is especially useful when you don’t want the entire scene in clear focus, which can help create an ethereal effect. Notice the blurred out edge and heightened focal point in the center of the photo below, which was achieved with a very large (wide) aperture. A smaller aperture (ie. f/10), on the other hand, creates a crisp and clear focus where everything is in plain sight – no secrets, no illusions. This forces the viewer to take it all in – every detail, every morsel. This is helpful for shots with many elements that all hold equal importance. Notice the photo below. Does the stack of brownies seem more in focus and crisp than the pizza above? That’s because it was taken with a noticeably smaller/narrower aperture. What else it does. Less artsy is the practical side of aperture: level of brightness. A larger aperture (f/1.4) lets in LOTS of light, and a smaller aperture (f/10) lets in a little bit of light. This meaning your photo will be lighter or darker depending on your aperture and the lighting in your room (respectively). So if you want a lot of bokeh in your photo and achieve this with an f/1.4, know that it will make your photo much brighter depending on your lighting situation and you’ll need to compensate by either increasing your shutter speed and/or decreasing your ISO. I could go into more detail here, but I fear I may complicate the matter. Plus, I’lll save that discussion for another tutorial. 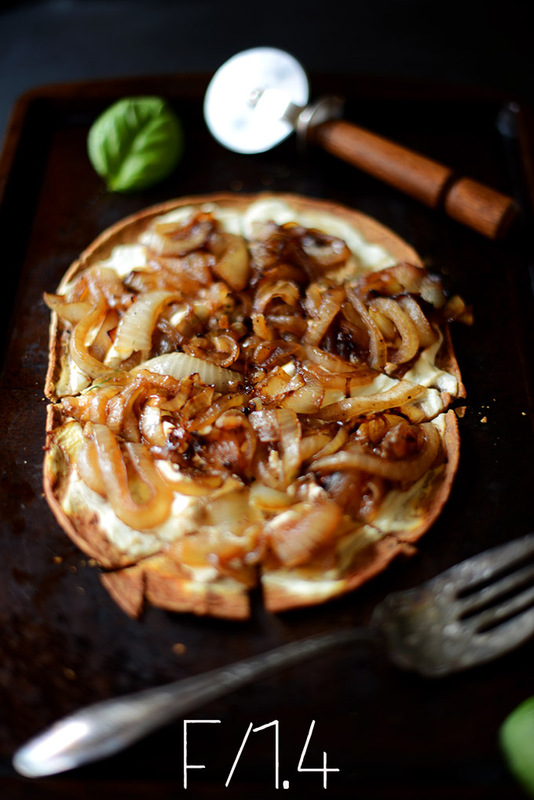 Images for this post were taken from Goat Cheese and Caramelized Onion Pizza and 2-Layer No Bake PB Brownie Bars. Found this tutorial helpful? Find 130+ more like it in our Food Photography School! Do you mean to say that f/3.2 is a safe bet with 50 mm lens? A cool trick too is to just use aperture priority on your camera if you don’t want to fuss with shutter-speed. I use a 50mm lens and my standard aperture go-to for most food photography is 3.5 (ish). This gives a nice focus to the focal point and some bokeh without being too over the top dramatic with bokeh, which is my stylistic preference. 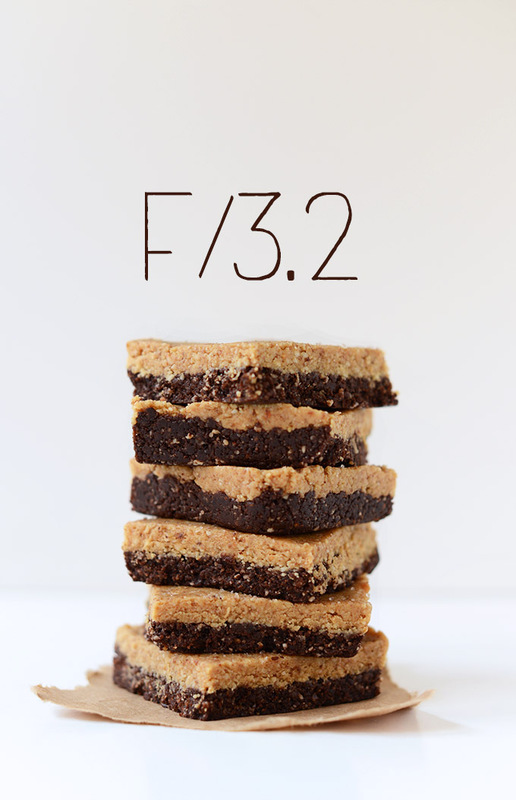 It’s nice for shooting stacks of cookies or brownies too as you guys show here nicely; I’ve found if you go much lower than the 3s you’ll end up with part of your stack in focus, and part completely blurry. The lowest apertures are nice for drama shots for a close-up of one particular part of your food. Can you please explain how I could decrease the file size of my images while maintaining the quality. WordPress is not letting me exceed 1MB. With that small file size I am not able to enlarge my photos because they become too grainy and pixelated. Please help? Can we definitely not exceed 1 MB for images? Or are my settings perhaps turn off. When you “save as” in photoshop or whatever program you use, save “for the web” so it condenses it. This was the most helpful post I’ve ever read on explaining this clearly! Thanks Dana.